To keep all Illawarra Club Members informed on current news and developments, The Illawarra Credit Union is helping by sponsoring this news page. On behalf on the SLSI Executive and SLSI Management may I wish you all a very enjoyable and safe Christmas. Thankyou very much to the patrollers who have volunteered to patrol their beaches over the Festive Season. On Sunday 4th December at around 2.40pm a beach goer tragically drowned at South Windang Beach. A lifesaver on a roving patrol from Windang SLSC became aware of a person in trouble in the surf 1km south of the Red & Yellow flags. Windang's IRB was despatched and the crew recovered 1 unconscious male and 2 other men in difficulty who had "doggy paddled" out to help their mate. This Christmas we encourage every one to experience the fun of the beach and have a great time but also to be aware of the dangers. Surf Life Saving Illawarra urges you to SWIM BETWEEN THE FLAGS and obey the rules and help our lifesavers and lifeguards, because if you do the life you save could be yours. There are some very basic rules that we ask you to be familiar with and a simple way to remember them is F.L.A.G.S. F ind the flags and swim between them. 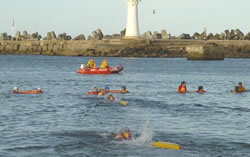 - The flags represent the area patrolled by the lifesavers and lifeguards. They mark the safest place to swim at the beach. L ook at the safety signs. - The safety signs help you identify potential dangers and daily conditions at the beach; these are located at the beach access points and at the flagged area. Please read them carefully before entering the water. A sk a lifesaver or lifeguard for some good advice. - Surf conditions can change quickly /water depth, currents, wave size and type. Talk to the lifesavers and lifeguards before entering the water and please dont ignore their advice. G et a friend to swim with you. - Always swim with a friend so you can look out for each others safety and can get help if needed. Children should always be supervised by an adult. S tick your hand up for help. - If you get into trouble in the water, stay calm, raise your arm and signal for help. Float and wait for assistance. Float with the current or rip, dont try to swim against it. Swim directly after a meal . Australia Day at Belmore will see our rookie lifesavers participate in the SLSNSW 2005 Award Winning Event. Contact your club rookie coordinator for details of the event. Our helicopter will be there again and we are all looking forward to a fun day. We will all be staying on for the fireworks display afterwards. Send an email to news@illawarrasurf.com with subscribe in the Subject Line and your name and organisation in the body of the message. Newsletter proudly sponsored by the Illawarra Credit Union - "It's why I like the Illawarra"